The David Gareji Monasteries and Hermitage are some of the most important cultural and religious heritage landmarks in Georgia. The site is comprised of 22 rock-hewn monasteries and more than 5,000 sanctuaries and cave-cells located in Eastern Georgia, on the semi-desert Iori plateau and partly extends into neighbouring Azerbaijan. The monastery complex was submitted to the UNESCO Tentative List in 2007 and is registered as a Monument of National Importance. The first of the monasteries was founded in the 6th-century by one of the thirteen Assyrian fathers, Saint David Garejeli, and his disciples. Over the following centuries, the various monasteries were built in the surrounding area with varying architectural features. Notable are the single-nave chapels and domed churches such as those at the Lavra and Udabno monasteries. In addition to the unique rock and built architecture, the Gareji monasteries are outstanding due to the significant number of preserved mural paintings, ranging in date from the 8th- to 18th centuries. In the 9th- and 10th centuries, the Gareji complex was an important cultural centre and a distinct school of monastic painting developed there during this period. The monasteries acted as a destination for Christian pilgrims with inscriptions in Greek, Arabic, Persian and Armenian still visible on the walls. The complex, with its numerous caves decorated with unique frescoes, dwellings and water collecting channels along with prehistoric settlements of the Early Bronze era, is a unique example of the harmonious interaction of manmade structures with the landscape that it is found in. The combination of rock architecture, medieval murals, prehistoric archaeology and paleontological fields makes the entire ensemble a masterpiece of Georgian culture. 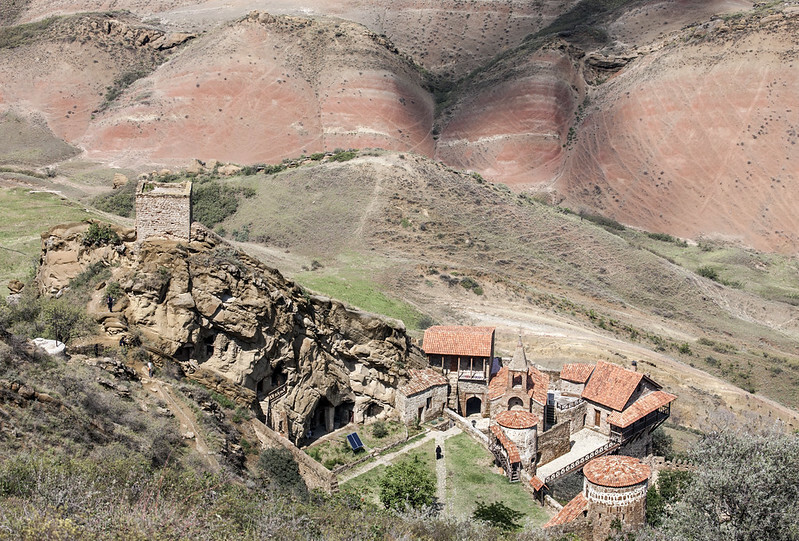 The David Gareji Monasteries and Hermitage now face the threat of irreversible deterioration. The main problem faced by the site is the disintegration of the rocks. Built mainly in sandstone, the complex is badly affected by intense erosion and the churches and other spaces subsequently suffer extreme structural damage. Throughout its history, the complex has been victim to the effects of man-made destruction, first following the Mongol invasion in the 13th-century and most recently during the Soviet period of the 1980s, when vibrations from gunfire in a nearby artillery range caused structural damage. The collapse of the structures also threatens the wall paintings which lose their foundation. In addition, the David Gareji site is partially located in neighbouring Azerbaijan, increasing the complexity and importance of its preservation. The David Gareji Monasteries and Hermitage is under the ownership of the Patriarchate of Georgia. It is still an active monastery center with daily services and this adds to its importance and underlines the urgency of its preservation. The lack of an overarching master plan or conservation strategy poses a challenge to the management of this important complex, as highlighted by the nominator, the Georgian Arts and Culture Center. Increased tourism to the site presents an opportunity but its sustainability needs to be addressed. So far, there is a lack of developed infrastructure in place for tourists, such as trails, handrails, signs, guidance or monitoring. As a result, tourists have unimpeded access to the remaining structures and murals and this poses a risk to the site.